According to the American Library Association (ALA), "A child's early experiences with language contribute to healthy brain development and lay the foundation for learning to read when a child enters school." As a result, parents and caretakers are the child's most important teachers before that child reaches school age. Basically, children learn better when they enjoy reading. Children are able to comprehend and to express themselves with a wide range of words. They are able to distinguish the sounds as well as the meaning of words. Children have learned that the black and white marks on a page represent spoken words. They are able to name the letters of the alphabet. Motivation to learn and appreciation for literary forms: Children have been exposed to a wide variety of literary experiences and have learned to love books and stories. *Babies love when you sing and read to them and tell them stories, poems and rhymes...and even small babies can enjoy books. *Board books and bath books are often the first books children will come across. They can be treated as toys, but they will help them learn how to handle books, how to turn pages and how to enjoy the shapes, colors and pictures. *Tell your baby and young child nursery rhymes and repeat them often. *Choose books with colorful pictures and simple words--or no words at all. *Encourage your toddler to point out objects, repeat words, and talk about the story. *Children often want to listen to the same story again and again. This is fine, as it builds confidence and familiarity with words, and reinforces that stories are fun. *Try to share books together each day, and not just at bedtime. *Help your child develop reading comprehension. Instead of reading the story straight through, ask the child open-ended questions about the story: "Why do you think Goldilocks ate Baby Bear's porridge?" "What do you think will happen next?" *Read or tell stories in the language you are most comfortable with. It doesn't have to be English! *Tell stories about your family and your culture. *Visit the library. Ask about story times. Borrow books to share with your child at home. *Encourage older children to read to their younger brothers and sisters. *Be an example to your children; let them see you read books too. Between the ages of 4 and 7, many children will begin learning to read, but you should still continue to read to them as often as possible. Remember, children learn at different paces. Be patient with your child. If he gets stuck, encourage him to make a guess by looking at the pictures and remembering what has happened in the story. *Make the most of books your child brings home from school. Read them, or parts of them yourself and talk about them with your child. *Allow your child to re-read favorite and familiar stories, or to hear you re-read them. Knowing a familiar book will help them notice more about the words on the page and they will start to recognize the patterns in new words and stories. *Listen to stories learned by heart and encourage your child to re-tell them in her own words, or even act them out. *Buy books as presents instead of toys. *Set up a special place for books from the library or their own books. *Find books about something you know they like. *When your child reads and gets a word wrong, let her finish the line before you correct her. Children often realize what the word should be and go back and correct themselves. If your child doesn't know a word in a sentence, get her to say "something" instead. She can often work it out from other words around it. *Most importantly, try to keep cool! It's important not to get fed up if your child needs to practice things over and over again. And remember, words are everywhere. 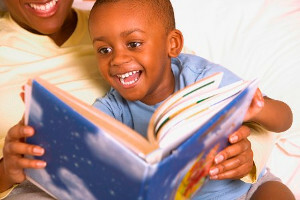 Encourage your child to read all sorts of things like cereal boxes, videos, billboards, street signs, newspapers, CDs.